In the very heart of Asia, at the intersection of trade routes of the legendary Great Silk Road the multi-faceted and fascinating Uzbekistan is situated. The history of Uzbekistan goes back to the times of the hoary antiquity, the first states in its territory appeared in the VIII-VII centuries BC. Surrounded by myths and legends this country year after year attracts travelers from all over the world in order to share its secrets and show them the great monuments of antiquity. The nature of this region will amaze you with the variety of climatic zones and recreational possibilities: the heady freshness of mountainous air and the dry and hot wind of the Kyzyl Kum desert, the shining snow-capped peaks of the Chimgan Mountains with its ski resorts and the endless steppes blooming in the spring with crimson splashes of poppies. To unravel the mystery of the Eastern soul, interwoven, like Suzanne, in the vast depth of the Universe you can when visit one of the numerous folk festivals or peer into a local teahouse for a leisurely tea. The spirit of the ages permeates this fabulous region, living by its laws, its reflection can be seen on the domes of the mosques, in the azure majolica minarets in the ruins of ancient settlements of fire worshippers– everything here is full of deep meaning and is subject to the centuries-old traditions, carefully protected by the people of Uzbekistan, famous for its true hospitality and ingenuity. That is also reflected in the art of cooking – a vibrant and diverse national cuisine will please gourmets – juicy, fragrant fruits of the scented south gardens, crispy Somsa and more than seventy varieties of Uzbek pilaf will not leave anyone indifferent! The sphere of tourism opportunities in Uzbekistan is quite extensive, it includes both cognitive tourism, which targets numerous architectural monuments, religious shrines, many of which are included in the List of the UNESCO World Heritage of UNESCO (Ichan-Kala in Khiva, historical centre of Bukhara, historic centre of Shakhrisabz and Samarkand) and active types of recreation and sports tourism: trekking, climbing, skiing. Plains occupy a large part of the country. The spurs of the Western Tien-Shan and Pamir-Alai framed Uzbekistan to the East and North-East. Kyzyl Kum desert – one of the largest in the world is located in the North Central part of Uzbekistan. Uzbekistan is presented by 12 viloyats (regions) and the Autonomous Republic of Karakalpakstan. Climate. The climate is extremely continental. The average January temperature is +3 +10 ℃, in July is +35℃, rising up to +45℃. Autumn in Uzbekistan is as warm as spring. The average annual rainfall does not exceed 200-300 mm. Economy. Uzbekistan takes the 4th place in the world in cotton production, 7th in gold production and has significant reserves of oil, natural gas and other minerals: uranium, silver, copper, zinc, coal, lead. Other components of the Uzbek economy are fruits and vegetables, livestock and textile industry. Religion. About 93% of population shrive Islam and 4% – Christian. Population. 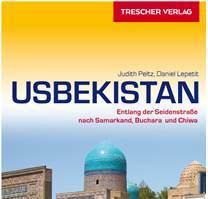 The population of the Republic of Uzbekistan is more than 32 million people; the majority are Uzbeks (80%). There are about 100 Nations and nationalities. You will discover a long history of Uzbekistan through experience of fascinating tours along its historic streets and beautiful monuments of ancient cities of the Great Silk Road! You will never forget this amazing and contrasting country that has preserved on its territory all cultural and historical layers like a living testimony of it experienced periods of prosperity and conquest.